In the digital era, Search Engine Optimization (SEO) is the key to maintaining a successful web presence. SEO offers a visible and effective boost to your search profile leading to a considerable increase of sales, profitability, and cost efficiency for our clients. We listen to you to gain a thorough understanding of your business. Then, we devise the right SEO strategy for optimum lead generation. 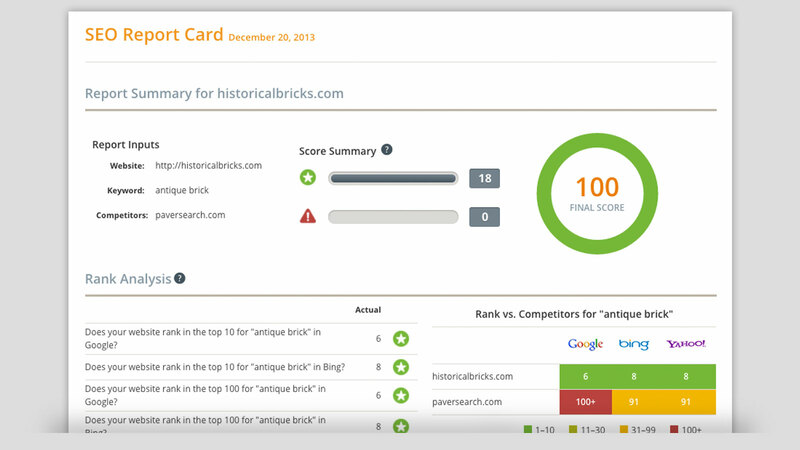 Instantly analyze your website’s SEO issues with our free reporting tool. Within minutes you’ll receive a report card that lets you know the health of your website. Any reported issues can easily be handled by our team and we’d love the opportunity to discuss how we can create and maintain a solid web presence for your business. Build authority through relevant keywords and content. Search engines, like Google, show websites that are authoritative and relevant when someone uses them to find information. The relevance is based on the content within a website. The authority is based on links from other websites linking back to the content of your website. One way to think of this is like voting. Every link from another website is like a vote pushing your website closer to being #1. Our team researches keywords to create engaging content to boost your site’s ranking for relevant search queries. We use our experience to strategically place the right keywords and phrases in the proper locations on your site. The more relevant your content, the more likely a user will become a viable lead. Let search engines know who you are and what you do. Providing internet users a functional, easy-to-use website experience is imperative for SEO and lead generation. Our team works to ensure your website is error free and up-to-date with the latest technologies and best practices to provide visitors an intuitive user experience. We also work to ensure that your business is represented accurately across the web through Schema.org tags, business listing websites and Google’s Knowledge Graph. Our technical experts regularly analyze your website to provide you key insights in visitor behavior and website performance.